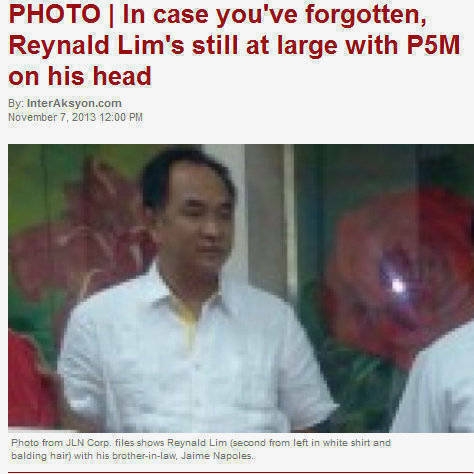 InterAksyon.com reports: "In case the public has forgotten, with all the hoopla focused on Janet Lim-Napoles, her brother Reynald Lim, her co-accused in the serious illegal detention case filed against them by their cousin Benhur Luy, is still at large despite a P5-million reward waiting for those who will rat on him and his hiding place." The report noted: "In 2010, Lim, known as ’JoKalbo’ to employees of JLN Corp., and wife Anna Marie Dulguime were convicted by the Sandiganbayan’s Fourth Division then chaired by Associate Justice Gregory Ong for falsifying documents in the delivery of 500 Kevlar helmets worth P3.8 million to the Philippine Marines. Napoles and her husband were also included in the case but the malversation charges against them were dismissed."